This print was also reissued in 2000 (see Reissues). In addition, at least one copy was printed on silver paper (see KISS Silver). For more information about the band, see KISS Music. From Supply and Demand, pg. 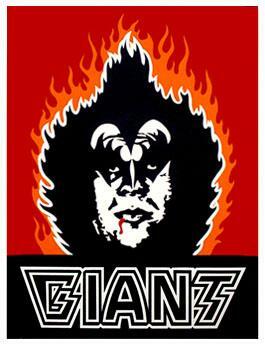 258: When I decided to do a KISS poster, I chose Gene Simmons because he was always my favorite member. I thought he had the coolest makeup, and I liked the blood dripping from his mouth and the pyrotechnics he always had around him. I threw Andre’s face in there with Gene’s makeup and hair, and did the Giant type to look like the KISS type. I tried to capture all the campiness of Gene Simmons and KISS and appropriate that for myself.